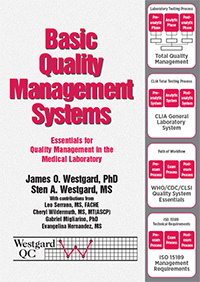 Westgard QC is proud to announce the publication of a new book, Basic Quality Management Systems. Download the Preface, Table of Contents, Index and Chapter Excerpts of this book. [Special discount: Save 15% off the cost of the book with the coupon code SAVEMYQSYSTEM. For medical laboratories in the US, it's become clear that CLIA compliance is no longer enough to assure the quality of testing. For laboratories that want to thrive and prosper - and beat out their competition - something more robust is required. For laboratories around the rest of the world, ISO 15189 is the de facto standard for quality, often directly referenced as the regulatory basis for the laboratory. Yet despite the availability of the ISO 15189 standard, the provisions are not well understood, and practical implementation is often a mystery. Rather than contract expensive consultants, now laboratories can start with a smaller step: an overview of the different aspects and provisions of the standard. What's in Basic Quality Management Systems? So do I really need to understand Quality Management Systems? Rather than making an uncoordinated set of attempts to assure quality, the Quality Management System unifies, systematizes, and standardizes Quality in the medical laboratory. It heightens Quality Management to the level of organizational culture. It ingrains the correct practices into the entire staff. While this seems like a tall order, Dr. Westgard shows practical ways to implement indicators, checklists, and benchmarks to achieve this level of quality.